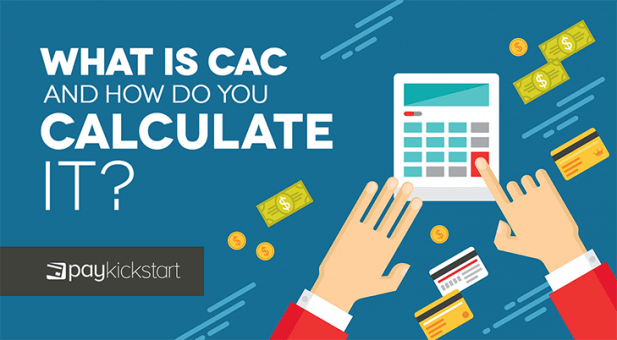 What is CAC and How Do You Calculate it? 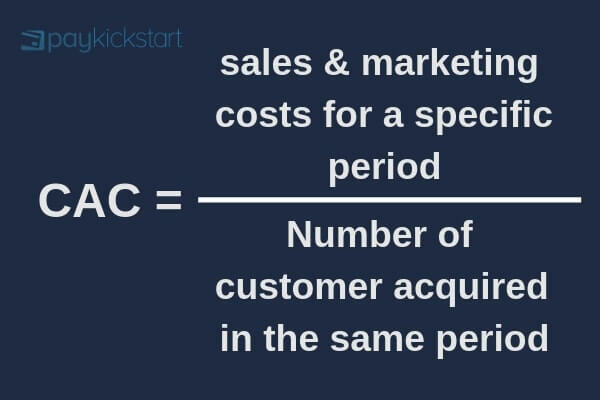 CAC (customer acquisition cost) is the average amount of money you spend to acquire a new customer. It’s also one of the most important metrics in your business because it determines whether your customer lifetime value is enough, how much profit you’ll eventually make, and which acquisition channels are viable. Let’s look at how it affects acquisition channels and profitability. I’ll use an example to illustrate this point. Let’s say you run Acme Inc which is my favorite fictitious company. Acme Inc. has tried multiple channels to get people to sign up for your subscription service. With Google ads and Facebook Ads, the customer acquisition cost was roughly $200. That’s not good or bad. What makes it horrible for Acme Inc. is its customer lifetime value (CLTV) of only $150. It was losing money on every new customer. It decided to switch things up and focus on referral and content marketing. Through those two channels, it was able to acquire a new customer at $30 and $50 respectively. That’s much better. Another company named Yuggle has similar numbers. It acquires customers from Facebook and Google at roughly $200. Its CLTV is $600 so those acquisition channels appear sustainable. Unfortunately, its ACV (annual contract value) is $200 so it takes a year to recoup its investment. That’s far from ideal. I’ll do one more example from a real company. The first acquisition channel Dropbox tried was Google Ads. It was acquiring customers at a little over $100 but the CLTV was just $99. If it would’ve continued down that route, it would’ve died a slow death. Instead, it switched gears and focused on a referral program where it gave away extra space for every person referred. Today, it’s not as generous but the goal was achieved. Dropbox is now a multibillion dollar company. Part of that success can be attributed to understanding CAC. On the other side of the coin, CAC affects the overall profit you can expect from a new customer. Your CLTV is more or less fixed unless you change your pricing structure, get better at upsells, or tweak your product line. CAC, on the other hand is fluid. If you dial in your messaging or use different channels you can pay less to acquire new customers. A larger portion of your CLTV is profit. Let’s look at an example to illustrate this point. Acme Inc. has another product with a CLTV of $500 and gross margins of 70%. Its acquisition costs are $100 per customer. Since the gross profit margins are 70%, that means each customer brings in $350 in gross profit. Remove the customer acquisition costs from that and you have $250 in profit. If CAC increases to $200 then the profit falls to just $150 without changing anything else. CAC has a big effect on your profit and the lower it is the more money you have to reinvest in your business. It’s the sum of all your marketing and sales costs over a specific time period divided by the number of new customers in the same time period. 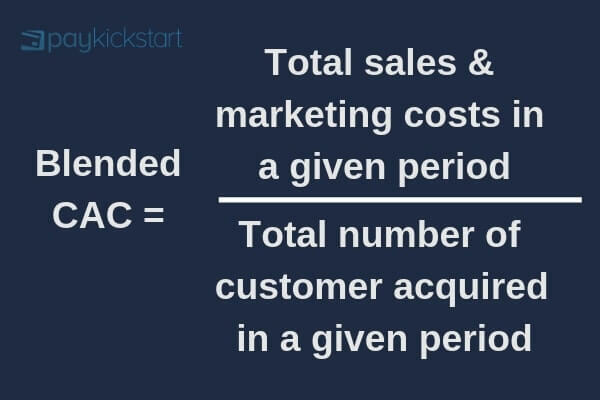 All of these are summed into your sales and marketing costs to get an accurate picture of CAC. What time period should you use to calculate it? Many people use one month to calculate it but that can be misleading. Think about the way you purchase products. You land on a blog post, video, or click on an ad somewhere. After that, you check out the product then file it away for later. After you’ve done a bit more research, you go back to the vendor and make a purchase. This process can take a few days to a few months. If you’re only calculating CAC over the course of a month then it may not be a true representation of how much new customers cost. You may have spent $5,000 last month and got $5,000 in new revenue. You seem to be breaking even which isn’t bad but not everyone who saw your message will purchase immediately. Or maybe the blog post you wrote take three months to make it to the first page. Either way, that $5,000 outlay will still be working. To account for this, calculate it across different time periods. Compare periods against each other to see how your CAC is changing over time. The stronger your brand the lower your CAC. There are two types or ways of looking at CAC. Blended CAC is the total direct and indirect costs associated with acquiring a new customer. For example, content marketing, speaking gigs, and podcasts are indirect costs. They’d still be considered when calculating blended CAC. When people refer to CAC, they’re usually talking about blended CAC. 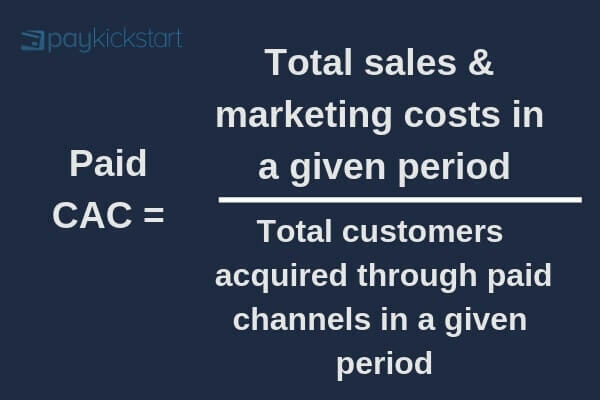 Paid CAC is the total costs associated with acquiring a new customer divided by the customers acquired through paid channels. 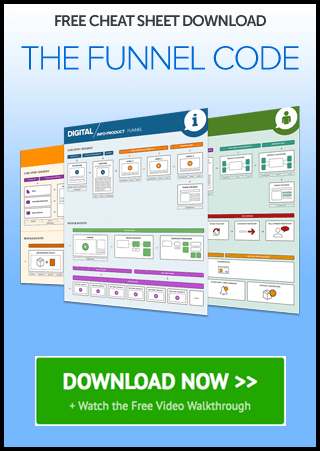 This CAC helps you understand how profitable your paid acquisition channels are and whether or not you’ll be able to scale them successfully. You can also look at paid acquisition via channels (which you should be doing anyways). Your CAC itself doesn’t matter. It only matters within the context of your CLTV and payback period. With that being said, the ideal CLTV:CAC ratio to aim for is 3:1. In other words, your CLTV should be 3x your CAC or more. The best CAC hits not only your CLTV target but also your payback period target. For example, your CLTV may be $1,000 but customers stay with you for ten years. Your ACV is $100. The ratio of 3:1 would mean your payback period is more than three years. How do you get to the ideal CLTV:CAC ratio? It’s straightforward to say but much more difficult to do. Keeping an eye on your customer acquisition costs is an integral part of a successful business. The moment they get too high is the moment you start to see your profit margins sink. The lower they are the better but there’s no such thing as the perfect CAC. It’s different for every business. Always keep in mind that your CAC has a direct impact on your profit and the acquisition channels you can use profitably. If yours is too high then try a few of the strategies suggested in this article to get it under control. Let me know what you think about CAC in the comments and don’t forget to share. Daniel Ndukwu is a regular contributor to the PayKickstart blog. He has extensive experience with online businesses, conversion optimization, and subscription revenue models. When he’s not writing insightful content, he works with other entrepreneurs to help them grow their bottom line. Meet the New Customer Billing Portal (Hosted vs. Self-Hosted). Tiered Pricing vs Volume Pricing, Which Model is Better?. Bundle Pricing Strategies That Work (plus Examples). The Ultimate Invoice Template for Invoicing Clients. How to Price Your Product in Three Easy Steps.